A necessary skill for the 21st Century is that students understand and make connections with cultures vastly different than their own. Students will learn about traditions of ritual painting that have survived for more than two thousand years in rural areas of North India. They will learn that India's great Hindu epic, The Ramayana, is celebrated in paintings in the village where the story originated. Students will gain an appreciation for the impressive artistic skills of unschooled, internationally recognized village artists and see how these artists are responding to modern conflicts that confront their changing society. By creating brochures and painting in the Mithila style, students will explore the discipline of art historian or curator and recognize the strikingly creative use of elements and principles of design. By developing their personal iconography in the design of brochures for an exhibit of their paintings, students will share with Mithila artists the satisfaction of documenting personally significant life experiences in their art. • What are the characteristics of Mithila painting?• How are these paintings made? Who makes them? • What is the role of art in village life? • How do the elements and principles of design affect your analysis of Mithila paintings? • Is Mithila painting "art" or "folk art?" Does it matter? • How are village artists becoming more "modern"? • Are modern-day issues causing the art to become more"Western"? • How are market forces affecting village painters? This unit coordinates with 9th grade World Cultures/Literature course, because part of the important Hindu epic, The Ramayana, is situated in the village renowned for this style of art. Mithila is the traditional birthplace of Sita, the beautiful daughter of King Janaka and heroine of the epic. This is where Lord Rama won Sita's hand in marriage when he strung the bow of Shiva, thereby triumphing over all the other suitors. With modification, the unit integrates with sixth grade social studies/language arts if reading the The Ramayana. The epic continues to play an important cultural, religious and political role in contemporary India. In The Hero With a Thousand Faces, Joseph Campbell traces the story of the hero and his trans-formation through virtually all the mythologies of the world and reveals an archetype and “mono-myth formula” common throughout history. Beginning with the hero’s “call to adventure,” the descent into unknown realms populated by demons and dangerous obstacles, the hero is aided in his battles by super- natural beings and special magical powers. Naturally, the hero will succeed in his quest before he returns home victorious. Whether it be Gilgamesh, Jason, Odysseus, Hercules, or King Arthur, “the hero” embodies the virtues of his culture and achieves literary immortality. The Ramayana, which means “Rama’s Travels”, is one of the greatest epics of all time. It is a 4,000-year-old story that tells of the deeds of Rama, the seventh incarnation of the god Vishnu, the Preserver. The Ramayana is regarded as a holy text by millions of Hindus who revere Rama and his wife Sita for the qualities they embody. Mithila paintings are sometimes called Madhubani which means “Honey Forest.” Mithila was a place of lush, fertile vegetation with numerous ponds and streams abundant with fish. In the Ramayana tale, it was the capital city of King Janaka where Rama earned the right to marry Sita. Mithila paintings have been in existence for nearly three thousand years. These have always been painted by women. The paintings often show scenes of the Ramayana, but episodes from the life of other Hindu gods and goddesses are also depicted. These paintings may include geometric designs and are extremely creative in form and use of color. Bright colors predominate. Mithila paintings are done on the walls of homes as well as on paper. A wall painting created primarily to commemorate a wedding may last fourteen years before deteriorating. Traditionally, the paintings were made by women and sent by a groom’s family to the bride’s family. Paintings by the Kshatriya caste were done in black and /or red inks. Brahmin paintings, also typically executed for weddings, were done in brilliant colors. Conversely, Harijan agricultural laborers would use a mixture of cow dung and water as drawing ink. When the brown lines dry, they would apply black ink dots to the lines. 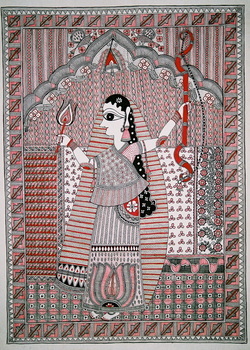 Mithila paintings are executed directly on walls or on paper. They are usually large and are prominently displayed in homes. Characteristics of the style are that the entire surface area of the picture is filled. The combination of figures and designs are outlined with second lines, drawn adjacent to the first. Vegetation, animals and geometric patterns are placed freely in the “open” areas. Blank space is avoided. As a woman works on her painting, she does so in prayer and meditation, believing the deity is drawn into the work. See the ORIAS "Hero Mono Myth" website for background, other lesson ideas, and more!